We offer buffet breakfast, lunch and dinner with a variety of food (including vegetarian options) in addition to tea and coffee in the afternoon. 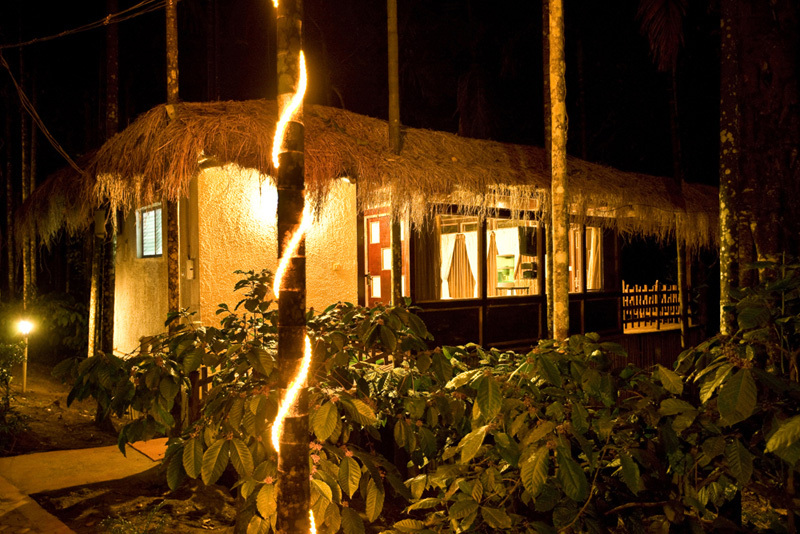 This cottage is constructed entirely out of areca palm timber. The room is spacious. There is no balcony but you can view the river from inside the cottage; it has an attached washroom. All cottages are provided with comfortable, modern furnishing along with 24-hour hot water and colour television. While the basic structure is made of wood, it is encased on all three sides overlooking the river with full-length glass windows. To meet the needs of large groups, each cottage is provided with two independent bathrooms. The cottages are mounted at first-floor level, with balconies overlooking the river and surrounding greenery. This tent house is a small but comfortable one-bedroom, thatched-roof unit with tented walls and ceiling. There is a bed and television inside and chairs to enjoy your outdoor view. An independent rest house is provided for chauffeurs with all meals at a small, extra cost. An open-air parking area is provided for safe parking of your vehicles along with wash and basic facilities for routine maintenance.